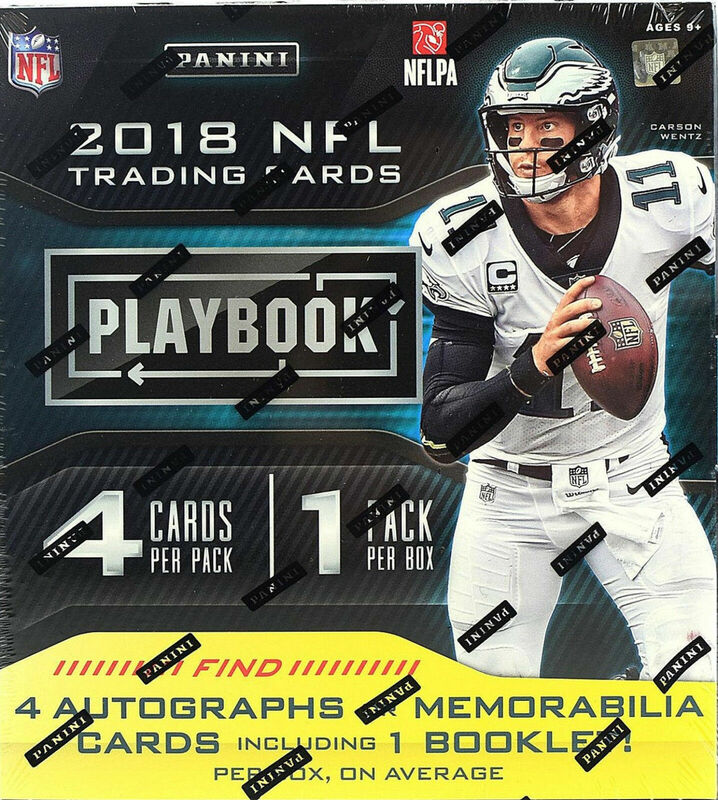 Each Box of 2018 Playbook Football contains Four Autographs or Memorabilia Cards, including One Booklet! Find Playbook with on-card autographed memorabilia booklets for the first time since 2012! 3 in every 4 boxes will deliver an on-card Rookie Playbook Jersey Autograph, sequentially numbered to 125 or less! Look for the return of the hobby's favorite jersey booklets in Armory, Game of Inches and Red Zone, all printed on acetate. Also find brand new tri-fold booklets in Nexus and Vault! Veteran stars, retired greats and historic coaches are all featured in impressive fashion in the form of Playbook Material Autos, Front 4 Jersey Signatures, Split 6 Signatures, Hail Mary Signatures, Coaches Quotes and much more! Look for Rookie Cards of Saquon Barkley, Sam Darnold, Baker Mayfield, Josh Rosen, Josh Allen, Lamar Jackson, Nick Chubb, Sony Michel, Ronald Jones, Calvin Ridley, Courtland Sutton, Derrius Guice, Christian Kirk, and Dante Pettis!